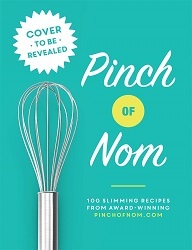 Carole Tonkinson, publisher at PanMac's Bluebird, has pre-empted World rights from Clare Hulton for Pinch of Nom: 100 Slimming, Home-style Recipes, the cookbook from the founders of pinchofnom.com. It is the UK’s most visited food blog with an online community of around 1.5 million people. The book went to number one overnight on Amazon on Tuesday night on pre-orders following an announcement on the Pinch of Nom site – potentially putting it on course to be the biggest debut cookbook of 2019. According to the acquisition statement: 'Pinch of Nom will include 100 mouth-watering recipes that can help home-cooks slim down while enjoying exciting, delicious and satisfying meals. The Pinch of Nom site was created in January 2016 by two chefs from near Liverpool – Kate Allinson and Kay Featherstone – with the aim of teaching people how to cook. When the pair decided to lose weight, they began sharing healthy slimming recipes and motivational posts. Since then, and with no traditional publicity to speak of, the site has amassed a sizeable online community, with 1.3 million Facebook likes, a closed Facebook group with 675,000 members and 90% engagement rate week-on-week, plus an Instagram following of over 250k. Pinch of Nom: 100 Slimming, Home-style Recipes will be a lead title for Bluebird, publishing in hardback next March. Tonkinson said: "With their delicious, satisfying recipes, Kay and Kate have helped hundreds of thousands of people make healthier choices. Their fakeaways seem indulgent but are actually full of naturally filling and healthy foods. Their community is warm and supportive: members test, comment and share the recipes and support each other in their aims. We’re thrilled to be working with both of them and we are positioning this as one of our biggest books for 2019." Allinson and Featherstone said: "We are thrilled and excited to be working on our debut book and to get people cooking healthy meals that are accessible to everyone. To have such industry leaders as Clare Hulton, Carole Tonkinson and all at Pan Macmillan working to make the book a possibility is an absolute honour. "The recipes we have devised are simple and tasty and we are so thankful to our followers to have seen the pre-sales rocket as they have. Our community is very special to us and we look forward to them being able to share the book with them."